Tai Chi Chuan is a martial art that combines martial arts movements with Qi energy circulation, breathing, and stretching techniques. It utilizes the ancient philosophy of Yin / Yang and the Five Element theories for its foundation and to establish its training principles. Tai Chi Chuan is a martial art that combines martial arts movements with Qi energy circulation, breathing, and stretching techniques. It utilizes the ancient philosophy of Yin / Yang and the Five Element theories for its foundation and to establish its training principles. The training of Taijiquan includes the integration of mind, Qi, and body. The focus on Qi circulation was initially used for the purpose of increasing the internal strength of the physical body for combat. The same techniques that were capable of developing internal power for combat, also proved to be effective as life prolonging, healing, and rejuvenating exercises. These health benefits are the primary contributions that led to the popularity of Taijiquan today. The value of Taijiquan is in its potential to strengthen and repair the physical and energetic body, which in turn has the potential to prevent and cure diseases. With regular practice of Taijiquan, it is possible to keep blood and energy circulation smooth in the entire body, and prevent disease. Traditional Chinese medical theory places prevention in the highest esteem; correcting a problem before any symptom occurs. If a problem already exists, it can be regulated through the regular practice of Taijiquan, before it causes any major damage. If the problem is already causing damage, then drastic measures may need to be taken to repair the damage. Once the damage is repaired, the non-jarring, slow, and integrated movements of Taijiquan, make an excellent recovery exercise for regaining health. The slow, relaxed, condensing and expanding movements of Taijiquan provide a total body exercise. As the muscles are allowed to relax, blood circulation can be improved. The gentle movements loosen up the spine, ribs and the internal organs. By "massaging" the organs, you can loosen up the tension around them and increase the blood circulation. The slow movements allow the body to move with less tension than high pace movements, which require fast muscle contractions. The slow movements of Taijiquan allow the lungs to be more relaxed and to increase the intake of oxygen. Harmony with Nature Qi means "energy" and it is the intrinsic substance or the "vital force" behind all things in the universe. Taijiquan exercise helps to redistribute energy in our body, by leading excess energy from tense areas, so as to regain balance. Performing Taijiquan early in the morning clears the mind and prepares one to tackle any task during the day. Chinese medicine believes that sickness is the result of the body's inability to properly adapt and adjust to the "evil" influences of nature. Because humans are a part of nature, any change in nature will inevitably affect the human body. When the influences of nature go above and beyond human adaptability, the balance between human and nature is destroyed. The human body functions will then be affected and sickness will result. Sickness will last until the body can attain the proper balance. It is known that, as early as the 4th century B.C., that the Life-Nourishing Techniques (Yangshenfa) were being practiced. They included bending, expanding, condensing, and extending movements; breathing techniques and Qi circulation, similar to Taijiquan's internal exercises. Based on the same energy theory, exercise and breathing techniques were created to adjust the imbalance of energy in the body, to build energy, and to increase adaptability to the environment. These exercises are known as Dao Yin and Tu Na. Dao Yin is the art of guiding the Qi to achieve harmony; and stretching the body to "massage" the cavities in order to reduce Qi stagnation and to attain flexibility. Tu Na is the art of expelling "old" air, and drawing in the "new" air — the art of breathing. 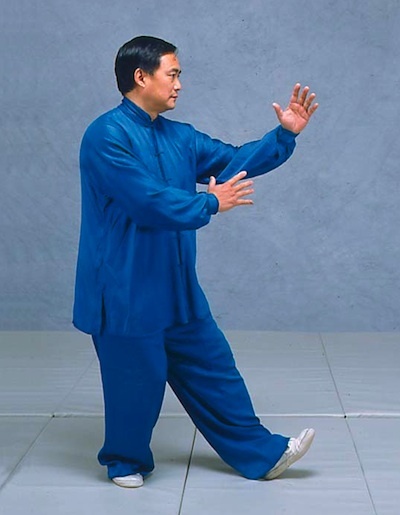 The combination of Daoyin and Tu Na techniques along with the circular movements of martial arts, became the healing / martial art known as Taijiquan. Training the mind is of the highest importance in Taijiquan. The Preparation posture, or Wuji stance, is to prepare the mind for the physical movements. Before starting the movements, the mind should be calm and steady. Stand naturally upright. Bring your thoughts inward instead of outward. Eyes look evenly forward. Relax your entire body. Imagine that there is a waterfall gently pouring over your head. As the water passes through your body, tension is released in your head, neck, shoulders, chest, spine, elbows, hands, hips, knees, ankles, feet, and toes; and then into the ground. Repeat this process until you feel completely relaxed and calm. Before starting the postures, touch your tongue to the roof of your mouth. As saliva is being generated, swallow it and use your mind to follow the saliva down your throat to your stomach. Then bring your attention to your lower Dantian — your body's center of gravity. When you begin to learn the postures, don't be overly concerned with coordinating your breathing with the movements. Once your movements are smooth, then start to pay attention to your breathing. Study the detailed guidelines and principles and try to incorporate them into the entire sequence. In 1956, the Simplified (or 24 Posture) Taijiquan was compiled by the Chinese Sports Commission. Tremendous efforts were put into promoting Taijiquan. The 24 Posture Taijiquan was derived from the traditional Yang Style Taijiquan 108-posture long form. It was the result of many Taijiquan masters working towards standardizing and simplifying Taijiquan, for use as a health promoting exercise. Many of the more complicated and repeated movements were deleted from the long form for ease of learning and practicing. The sequence starts off with very simple movements and gradually becomes more complicated. Even though the 24 Posture Taijiquan sequence is a simplified version of the long form, it is still a "traditional" sequence with the original martial applications in every movement. It consists of 20 different postures from the Yang Style Long Sequence. Three of the postures are done on both left and right sides, and one of the postures repeats itself, making a total of 24 postures. Because this sequence is based on Yang Style Taijiquan, the training guidelines and principles of Simplified Taijiquan follow the characteristic "flavor" of the Yang Style. The entire Simplified Taijiquan sequence should be performed at an even pace with no abrupt changes in the transition, and following the traditional guidelines and principles, which are outlined in the Detail sections of the DVD and textbook 'Tai Chi Chuan'. In 1976, another standardized Taijiquan sequence was compiled by the Chinese National Athletic Association. The new sequence was called 48 Posture Taijiquan. It broadened the content of the Simplified Taijiquan sequence by adding additional postures from the Yang, Chen, Wu, and Sun styles of Taijiquan. The new postures were modified and performed with the characteristic "flavor" of the Yang Style. Therefore, the same guidelines and principles of Yang Style Taijiquan applies to the 48 Posture Taijiquan. The only exception is that the Simplified Taijiquan sequence is performed at an even pace, and the 48 Posture Taijiquan includes some fast movements. The fast movements are a characteristic of martial arts power emission called Fajin.